A Blaster (read rocker) and a Flatlander (country-folk) doesn’t sound like a recipe for a duo. 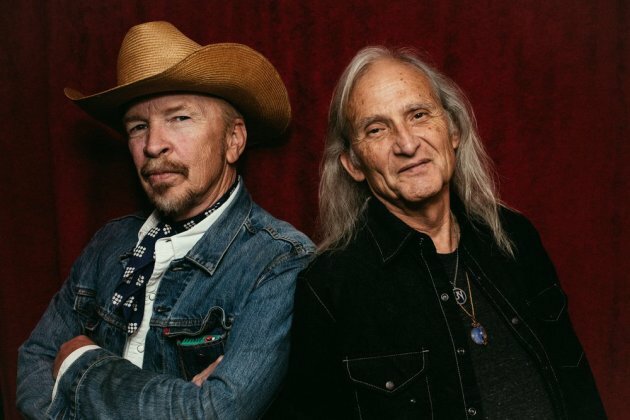 But high-energy Dave Alvin is an all-purpose Americana guy and gentle Jimmie Dale Gilmore actually can rock. Hence, the Alvin/Gilmore duo turned out to be a roots-rockin’ treat on Thursday night at the Dakota Jazz Club. But mostly the duo rocked for 100 minutes, whether it was on Alvin-penned gems like “Fourth of July” and the Blasters’ “Marie Marie” or a cover of Lloyd Price’s 1952 classic “Lawdy Miss Clawdy” (with Gilmore as a convincing R&B shouter) or Gilmore’s “Dallas” featuring Alvin’s smokin’ guitar. One non-rockin’ highlight was the true duet “Billy the Kid and Geronimo,” one of two originals on the new album, in which Alvin sang the part of Billy and Gilmore Geronimo. Great band, great songs, great spirit, some good humor. It added up to a blast. Adding to the festivities was unadvertised opening act Jon Langford, a chatty Welshman full of energy and clever lyrics who came across like a hybrid of Joe Strummer and Elvis Costello. And Langford, a veteran of the Mekons and Waco Brothers, is a gifted painter, too – he created the cover of Alvin and Gilmore’s “Downey to Lubbock” album.